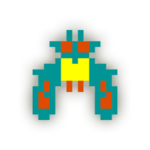 Boss Galaga is an alien species from the Namco-developed Galaga games. In the franchise, it is an enemy that uses a tractor beam to capture the player-controlled spacecraft, bringing it on the enemy side. Boss Galaga is also present as an item in several crossovers with the Mario franchise, where it displays similar capabilities. Boss Galaga appears as one of Pac-Man and Ms. Pac-Man's special items in Mario Kart Arcade GP, Mario Kart Arcade GP 2, and Mario Kart Arcade GP DX. Boss Galaga is thrown forward in a straight line. Upon hitting a rival racer, Boss Galaga will lift them into the air with its tractor beam, causing them to lose time in the race. Boss Galaga also appears as a regular throwable item in Super Smash Bros. for Nintendo 3DS and Super Smash Bros. for Wii U. Once a player picks up and throws it, it searches for an opponent to begin sucking up with its tractor beam. Once it successfully does so, it stalls momentarily before flying up in the air and taking the player off the stage, costing the player a life. It is possible for a player caught in the beam to be freed if Boss Galaga is struck or hit before it completely flies off the stage. It turns blue to indicate it has been hit and then lets go of the captured player. The Boss Galaga item returns in Super Smash Bros. Ultimate with the same function. Here, as an opponent is caught, the background changes to the scrolling star scenery from the original Galaga. The game also features Boss Galaga as a spirit, which grants the user immunity to burying attacks. In World of Light, the spirit is encountered on the Mysterious Dimension sub-map of the Dark Realm. To obtain it, the player has to win a battle against a team of five tiny Pac-Mans on the Lylat Cruise stage. The only items spawned during the battle are Boss Galaga. Alternatively, the player can obtain the spirit by summoning it with the cores of a Swooping Snitchbug and a Bandit. This page was last edited on February 23, 2019, at 13:11.